A 24 Hour Fitness in Bellevue, WA saved two, (TWO!) lives last week with the same automatic external defibrillator in the the span of two days. The first was on Wednesday when a 79 year old man collapsed on the racquetball court. The staff quickly called 911, started CPR and deployed the AED which successfully restarted the man's heart. The next day another man, 66, collapsed during a Zumba class. In similar fashion, the staff at 24 Hour called 911 immediately, started CPR and again busted out the recently used AED, successfully saving the man. Talk about a crazy week! I can't even imagine. No one ever wants to be put in that situation, but to have it happen twice in 48 hours? Nuts! You have to really give it to the staff at this gym. These people are nothing short of heroes. I know I'm about to sound like a broken record here, but having an Automatic External Defibrillator in your facility is a life or death situation...literally! Everyone needs to have one on hand so that they are prepared if a crisis occurs. 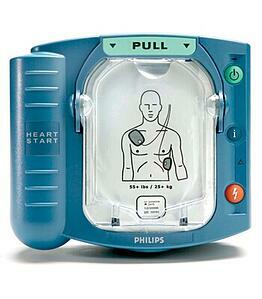 Using an AED within the first few minutes of a cardiac arrest can increase a victim's survival by 70-80%. We hear so many stories here about how an AED made the difference that we keep one at the office and have given them as Christmas presents to our parents. Here at Zogics, we sell the HeartStart OnSite AED. The Philips HeartStart defibrillator (M5066A) is the most popular AED sold worldwide. Additionally, it is the only AED available without a prescription. Hopefully you will never have to use an AED, but if you do, having the right technology can make all the difference.